I’m one of those people that is afraid of the color red. I absolutely love red’s little sister pink, but I wouldn’t be caught dead in red lipstick and I have very few red articles of clothing. I think it’s just such a look at me color and demands a confidence I don’t know if I can pull off.Every actress/singer who wears a red dress at a premiere or an event has to own it. If they don’t the color will end up wearing them. 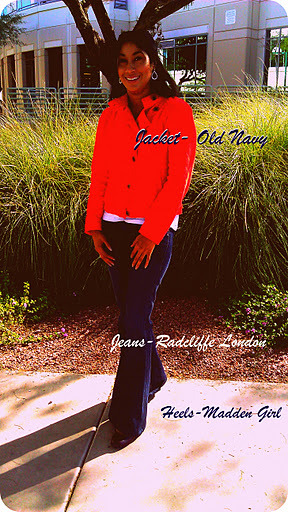 Any way, I decided to branch out and get this red jacket from an Old Navy in Seattle. I’ve only worn it twice including today but I received multiple compliments both times. One of my fashion resolutions for next year is to buy more red and less grey. If you saw yesterday’s post, you understand why. I think I’m only doing this challenge Mon-Fri. So we shall meet again next Monday.